Thoroughbred Racing and other opinions. Mike MacAdam covers horse racing and local sports for The Gazette in Schenectady. He's an excellent writer, and a really nice guy too....and I say the latter not only because he wrote so eloquently about impending changes at Saratoga, thereby saving me the trouble of having to write a post on the topic while the Head Chef and I are away on our annual summer extravaganza down at my mom's house near Sarasota, FL. In case you missed it last week, here is Mike's column (embedded here via Twitter with the hope that you'll be able to bypass the newspaper's paywall). This column, written after Chris Kay's remarks at the annual preview press conference last week, sums it all up perfectly, from the price gouging to the "creepy corporate Disneyspeak" defending it, to the proliferation of "pockets of exclusivity in what historically has been one of the most democratic places in the country." It's just perfect, so please give it a read. Not at all necessary for me to say much more. And that's right, this area is being compromised for a museum. Don't want to speak for all of you, but this horseplayer, in over 35 years of Saratoga, has attended the existing National Museum of Racing and Hall of Fame across the street from the track exactly once; and I don't really remember a thing about it. Seems to me this new museum will be more for the "guests" than for the horseplayers who support this whole endeavor. Not sure exactly what the point or purpose of plopping a museum in the middle of a track is....will they be charging admission? While supposedly a tribute to Saratoga legends, as Tom Noonan succinctly put it, "one suspects it is really a tribute to Chris Kay." 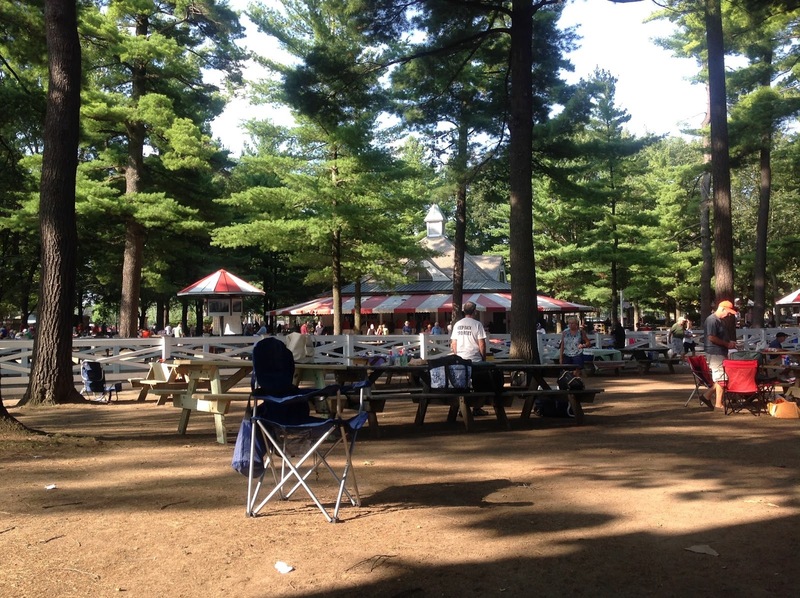 But what might be the most upsetting aspect of this whole sorry affair to me - more even than the price increases, infringement of popular picnic areas, and the hypocrisy of this NYRA - is the fact that six grandiose trees have been cut down in order to make way for a museum. Now, I wouldn't quite put myself in the tree-hugging category, but those magnificent, cloud-scraping trees that populate the backyard of the track are, to me, an integral part of the experience; a major, if not the major, contributor to the majesty and tranquility of the place. Many a time have I drifted into a sedate state of meditative bliss lying back in my chair staring up at them. (True, at times while under the influence of various mind-altering drugs conducive to such a state, but still...) To take trees out of Saratoga is like removing flamingos from Hialeah, the San Gabriel mountains from the backdrop at Santa Anita, or the cries of "bloodclot" from Aqueduct. And what makes this defilement of the sacred grounds of the Spa even more ponderous is this: before he came to NYRA, Chris Kay was the Chief Operating Officer of an environmental group, The Trust for Public Land! Its mission is "Creating Parks and Protecting Land for People." We protect the places people care about and create close-to-home parks—particularly in and near cities. And while the organization generally deals with larger and more urban areas than is Saratoga, the inconsistency between his mission there and his actions here are quite obvious. While at Trust for Public Land, Kay used the word "parks" as much as he presently uses the word "guest." Yet, now at NYRA, the grand park - is there another way to put it? - that constitutes the backyard of Saratoga is readily sacrificed, whether for profit or for vanity, solely at NYRA's whim; correct me if I'm wrong, but I don't recall any public input regarding the removal of these natural treasures. And I mean, I thought the state now owns the land??!!?? Many people feel as if Chris Kay drips with insincerity when he talks in glowing terms about our sport, whose jewel track he has come to be entrusted with. Considering and contrasting his past position with his present actions may serve to put his words now in an even harsher context. We better hope that Kay does not go on to run a racino. He may decide that his guests are better served without any pesky racetracks nearby. Compliments on an artful depiction of the smarmy, shameless opportunism that permeates every aspect of Chris Kay's being. I was very sad to see the demise of these magnificent specimens that undoubtedly have witnessed all the Hall of Fame moments that they claim to be honoring in the "Museum" that they will surely attempt to monetize. Ambivalent about the other changes but the "Sports" Bar (what sports, exactly, take place during the day during this timeframe? )replacing the carousel and museum replacing this picnic area are simply disgusting. Nice job by the Post reporter to pick that up! The bar in the Carousel was a great idea. That was probably the most wasted space in the entire place. I imagine once people see it they will realize this. the cries of "bloodclot" from Aqueduct. they're executing Cuomo's vision. Money first. And second. Kay's expertise is corporate restructuring to position a business for resale. His mandate was to make NYRA profitable so racing could stand on its own, and he is following that mandate, which by nature emphasizes short term gain. We can disagree with his methodology but all of this should have been expected and as Anon says any blame to be placed belongs with Cuomo. Spent the weekend there and on Jim Dandy day only about 60% of the tables in the "sports" bar were occupied, what a waste of space. Its basically a two sided NYRA concession stand with a few flat screen on each side. I have no idea what NYRA announced as attendance for Dandy Day but as someone who has attended at least 10 Dandy's in a row this seemed the least attended. The 4 horse field took its toll I presume as it emptied out prior to and during the stakes portion of the day, guess everyone decided to get a jump on the evenings festivities. As I have put forth many times Friday's Curlin Stakes serves no purpose but to further water down an already thin group of 3 yo's spread out among the Haskell, Jim Dandy and WV Derby that weekend. I suppose they figure it results in an extra starter or two for the Travers but does so at the expense of the Dandy. I'm wondering how handle at Saratoga is up $40 million after 13 days vs the first 13 days of 2013 if things aren't going well at Saratoga as "Figless" suggests. Here are some things for you...Monday's on-track handle at Saratoga was under $100K less than the on-track handle at Monmouth on HASKELL DAY. Yeah, I'm sure it was empty on Jim Dandy day. From someone who has been there everyday...the place is mobbed...with people having fun and they are betting...a lot. Sorry if you don't like it, and surely good weather is a key, but the racing has been amazing, and the bettors are responding. The new bar is actually great, Shed your agenda and enjoy your life. It won't hurt you. I promise. Oh, one more thing...the winner of the 2014 Curlin went on to win the Travers. He's also in the 2015 Whitney, and some very smart people I know like his chances. Yeah...NYRA needs to get rid of that race. Honestly, the post from Figless is pathetic. Jeesh, what did I do to piss you off? Were you the one that recommended installing the widely criticized sports bar, which is the only reason I decided to check it out and report my findings? Where do I start to rebut your absurd comments? Handle is up because the weather has been perfect. increasing field size which directly impacts handle, irrelevant to my discussion above about one specific race day. Handle and attendance are completely independent issues. I have bet more from home this meet than I have on track, for example. I have no agenda. I enjoyed my trip as always, and am perfectly happy in my life, thank you for your concern. In fact the smaller crowd is more enjoyable. But the fact is while attendance was in fact solid that day, the sports bar was half empty mid day and many of the patrons left before the Jim Dandy, reflected in the empty apron right before the race. I sent picture to Alan to prove my point. What is my agenda all knowing anonymous one? I generally support new NYRA and the changes that have been implemented, but believe the sports bar was a mistake and the Curlin is superfluous. I attend the Dandy every year and since the Curlin was added it has impacted that field size, especially combined with the dilution due to the WV Derby the same weekend. How the 2014 winner did subsequently is irrelevant to the discussion. He would have been in the Jim Dandy last year if the Curlin didnt exist, and the Jim Dandy would have been a better race. As it would have been this year with the Curlin winner in the race. There are too many competing races for three year olds, which most in the industry agree. The watering down of our graded stakes races due to too many newer, big money, competing races is one of the many issues plaguing this industry. The irony is that the sport provides short fields for most of its major races, excepting the Triple Crown and Breeders Cup. So when the sport has the most eyes on it they provide an unattractive product from a wagering perspective. There were 20 folks in my group, and when most of them should have been excited about the feature race featuring familiar horses from the Triple Crown trail they were bitching about there being only four horses. Fact. And that is why I made my comment. Enjoy the rest of the meet. As for the Haskell, the apron was actually way more crowded when the Haskell was televised as opposed to the day before with the Dandy. So AP's race had a positive effect on Spa handle that day. But I was commenting not on the meet in general but two specific things, the new bar, and the field size in the Dandy.